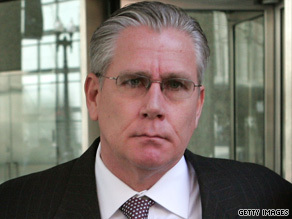 CHICAGO, Illinois (CNN) -- Police are investigating the death of the former chief fundraiser for ex-Illinois Gov. Rod Blagojevich as a "death-suicide," an Illinois mayor said Sunday. Christopher Kelly, 51, was former Illinois Gov. Rod Blagojevich's chief fundraiser. Financier Christopher Kelly told police shortly before he died Saturday that he took an "overdose of drugs," said Dwight Welch, mayor of Country Club Hills, Illinois. Country Club Hills police found several drugs in Kelly's black 2007 Cadillac Escalade, but they were not sure yet whether they were prescribed, Welch said. Country Club Hills is about 27 miles south of Chicago. Kelly had recently undergone surgery and was taking drugs following the operation, Welch said. Welch said he did not know which drugs Kelly was taking. Kelly, 51, of Burr Ridge, Illinois, was pronounced dead at Stroger hospital in Cook County at 10:46 a.m. Saturday, hospital spokesman Marcel Bright told CNN. Autopsy results were expected Sunday afternoon, Welch said. The Cook County Medical Examiner's Office did not comment on the results, but said that a ruling on Kelly's death was "pending further studies." Toxicology results won't be available for "some time," Welch said. Blagojevich blamed the government for Kelly's death. "I don't know any more than you know, except that a friend of mine took his life because he refused to submit to the pressure by the government to lie about me," Blagojevich told CNN. "And to think that it comes to something like that begs a lot of questions." Blagojevich said his statement that Kelly "took his life" was based on what he had read in news reports. Earlier this year, Blagojevich, who was impeached and removed from office, pleaded not guilty to federal corruption charges. A federal grand jury in April indicted him on 16 felony counts, including racketeering, conspiracy, wire fraud and making false statements to investigators. The indictment also named Kelly. On Tuesday in a separate case, Kelly pleaded guilty to two counts of mail fraud "in a kickback scheme to bring in $8.5 million in business at O'Hare International Airport to his roofing company," the Chicago Tribune reported on its Web site Sunday. Kelly was to begin a prison sentence this week, the Tribune reported. Kelly was transferred to Stroger hospital after first receiving care at Oak Forest Hospital, near Country Club Hills, where police spoke to him at about 3:30 a.m. CT Saturday, Welch said. Police described Kelly as being "very hesitant, very ill" during that interview, Welch said. As part of their investigation, police want to talk further with Kelly's girlfriend, Clarissa Flores-Buhelos, Welch said at a news conference Sunday. Kelly and Flores-Buhelos, 30, communicated via text messages before she drove from Chicago to pick him up, Welch said. She found him ill and drove him in his car to Oak Forest Hospital, he said. She told police that Kelly had attempted suicide, Welch said. But since then, Flores-Buhelos has retained a lawyer and is not talking to police, Welch said. Police plan to use the text messages and the GPS device in Kelly's car to determine where the two were prior to arriving at the hospital. Police also want to talk to a man who came to Oak Forest Hospital to pick up Kelly's car, Welch said. He has keys to the vehicle but the car has been confiscated by the police as evidence, Welch said. Chicago police and the FBI are also involved in the investigation, Welch said. CNN's Jesse Solomon and Justin Lear contributed to this report.